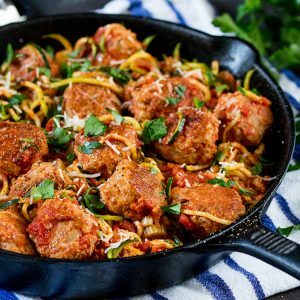 A lighter alternative to regular meatballs, these One-Pot Turkey Meatballs With Courgetti are tender and delicious! 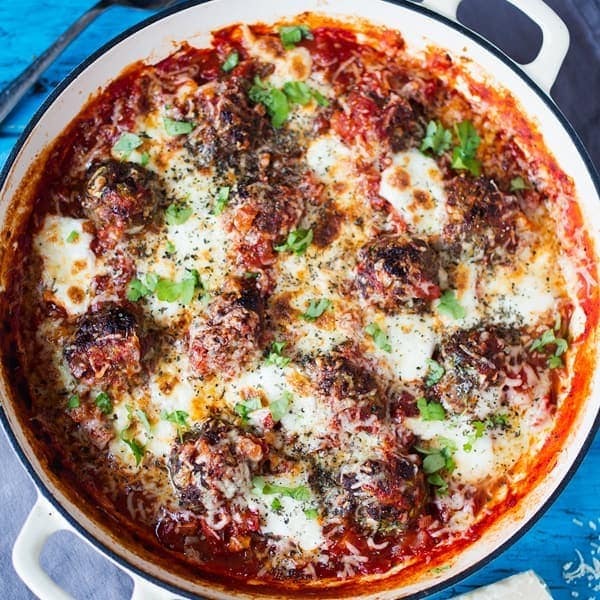 One-pot meatballs are a complete revelation to me. I’m very fussy when it comes to meatballs. Not only have they got to be juicy and flavourful, they’ve also got to be perfectly browned, with a light crust on the outside. I thought the only way to do this was to either fry them separately, or cook them in the oven. 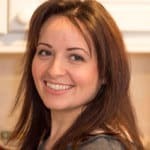 When I finally realised (with this meatballs recipe) that I could save myself a ton of washing up by cooking them in the same pan as the sauce AND the pasta, I was delighted! Anything to save time at the dreaded sink. I’m now upgrading further to a lighter version, made with turkey mince and courgetti! If you’re not a fan of courgetti (or zoodles I think they’re called in the US), you can replace with 600ml (2 1/2 cups) just boiled water and 200g (7oz) dried spaghetti (all added to the pan with the meatballs), then simmer with the lid on for 10-12 minutes to cook the pasta. I sometimes do a mixture of half and half – cooking the spaghetti in the meatball pan and adding the courgetti at the end. I was hoping to get another pasta recipe out this week too – a cheesy, veggie one-pot pasta that I posted on Instagram last week. It’s been one of those crazy weeks though! We finally completed the kitchen and office YAY!!! So we’ve been filming some footage for the kitchen reveal video, and I’ve also been doing some work with the Neff team in my own kitchen. I can’t tell you how nice it feels to invite people into the kitchen and feel proud of how it looks. The first time in my life I’ve had a kitchen that I absolutely love! 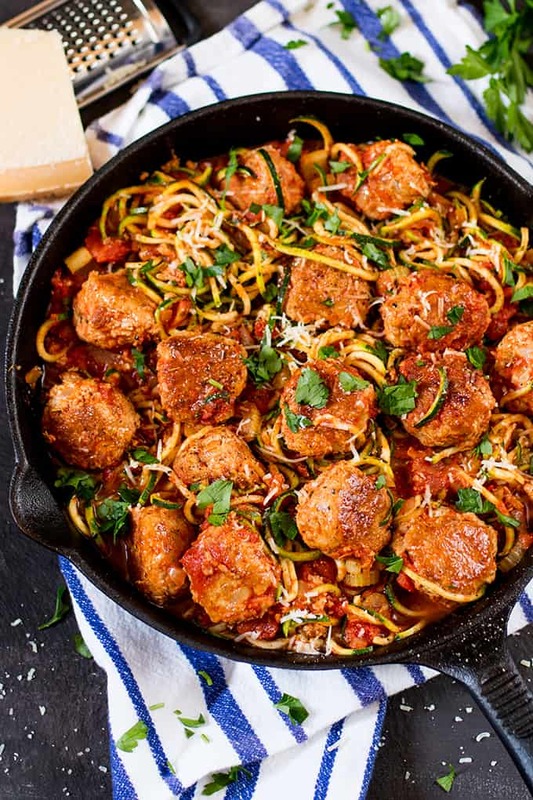 I first made this One-Pot Turkey Meatballs With Courgetti for Superfood magazine. 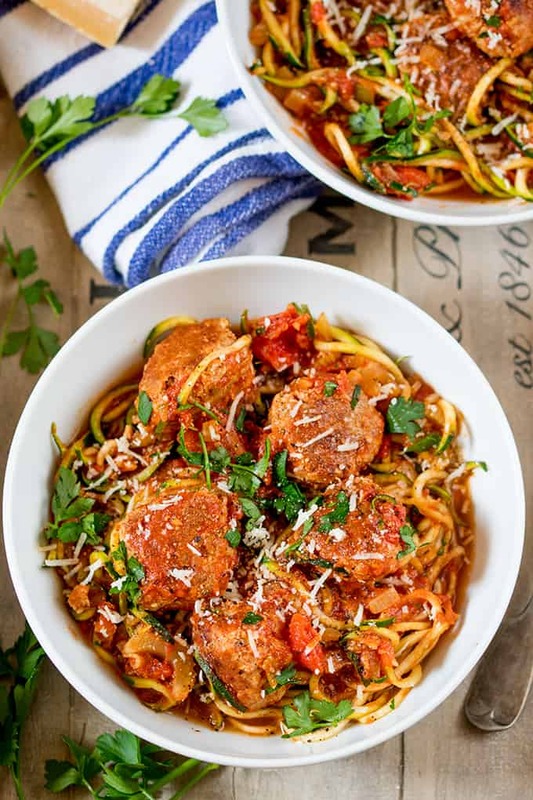 A lighter alternative to regular meatballs, these One-Pot Turkey Meatballs With Courgetti are tender and delicious! 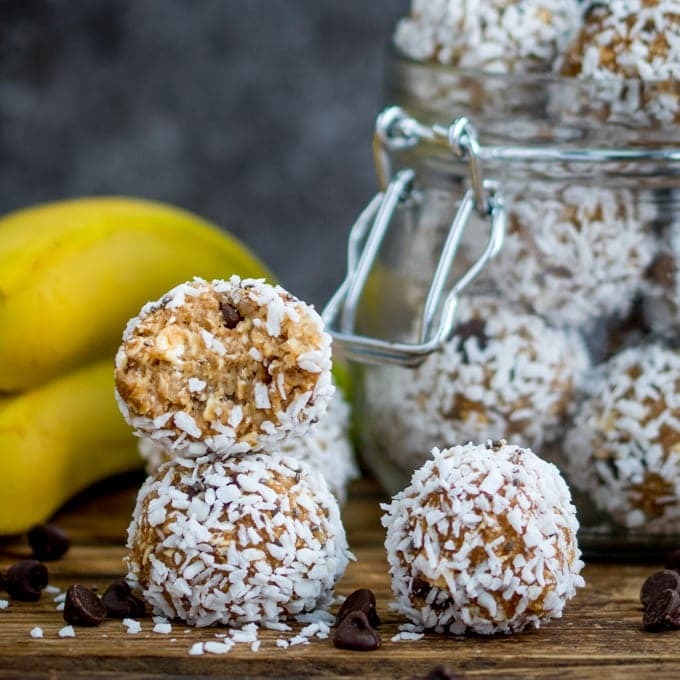 Low in fat and gluten free too! In a large bowl, place the turkey mince, 1 tbsp of olive oil, parmesan, egg, half of the chopped onion, the grated bread, salt and pepper. Mix together with your hands and form into meatballs – about the size of a walnut. You should get around 20-24 meatballs. Heat the remaining 2 tbsp of oil in a very large, non-stick frying pan. Add the meatballs and lightly brown on all sides. This should take around 6-8 minutes. Be careful when turning the meatballs over, as they’re quite delicate. Add the remaining onion, celery and garlic to the pan, and cook for 5 minutes until the onion starts to soften. Add the tinned tomatoes, tomato puree, thyme, honey and stock. Bring to the boil, then simmer gently for 10 minutes. Add the spiralized courgetti. Gently stir into the sauce and place a lid or some foil on the pan. Cook for a further 3 minutes until the courgette has softened. 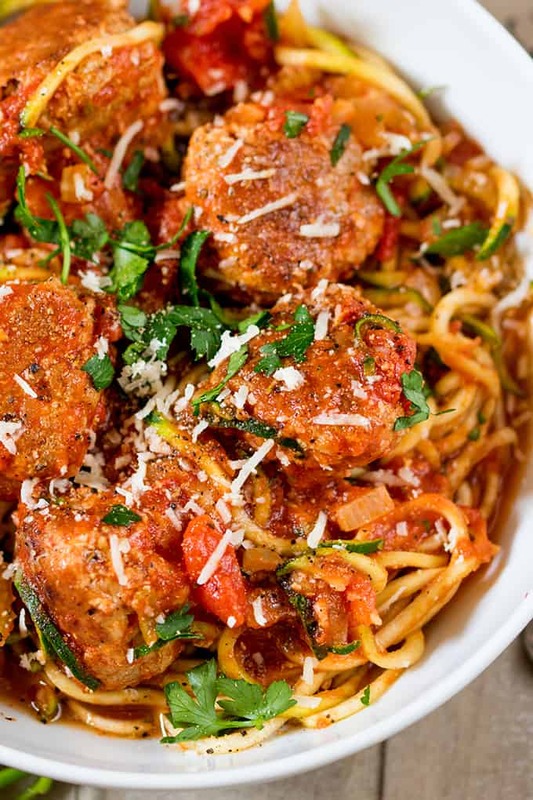 Serve the courgetti and meatballs topped with freshly grated parmesan, black pepper and chopped parsley. 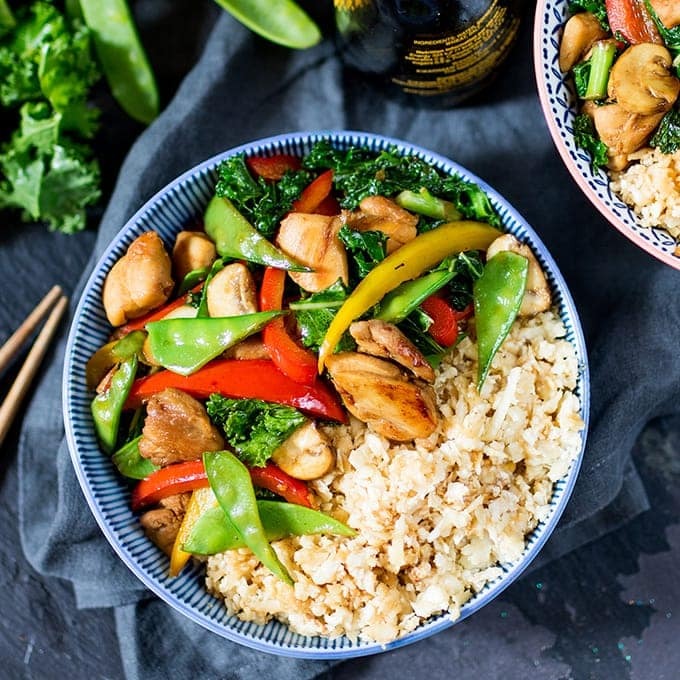 I’ve been looking for lower carb and fat meals. 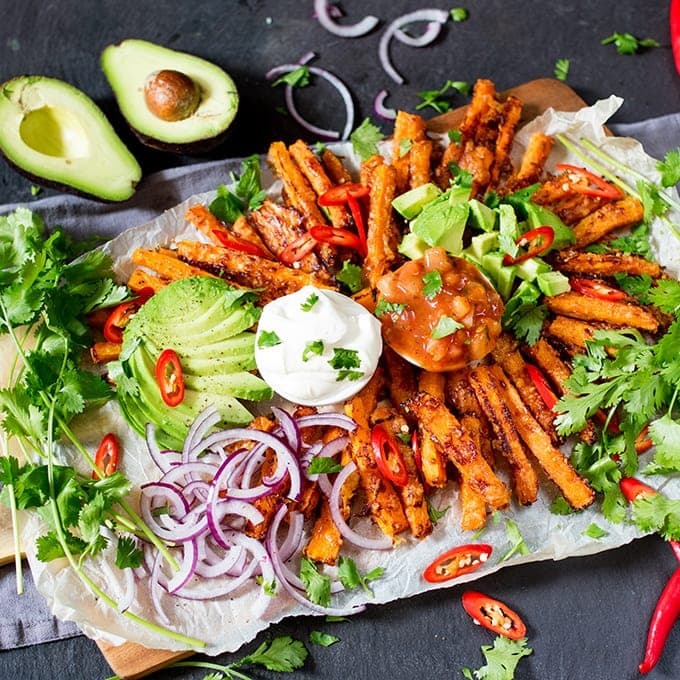 This has been added to our weekday meal list (we try to be good during the week). This is definitely a keeper. 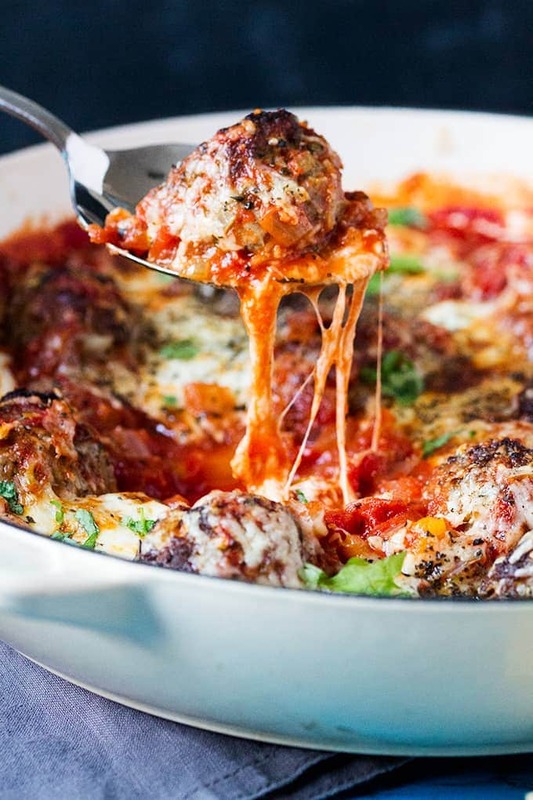 with the one-pan craze upon, these meatballs are seriously the next best recipe! They look so moist and flavorful!